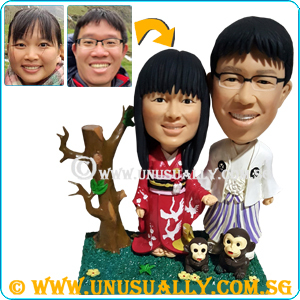 * As this is a 3D caricature figurine, we promised our customers a 60 - 70% resemblance to the photo supplied but not the real person as artists refer to the photo to sculpt & hand-make the figurine. * Standard order process will take around 21 working days upon completion of placing of the order with all necessary info and payment made to us. 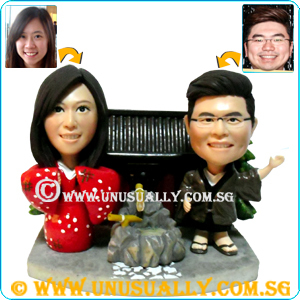 * For standard order process, we will provide sculpted head proofing process to ensure the figurine resemble to the person photo. This process will be provided to customers free of charge as an additional service to protect customers interest. * With an additional of SGD25.00 per figurine. You can make the figurine into bobblehead figurine. It means that the figurine head will move. * For an additional of $15 (< 15 alphabets). You can have the option of adding wordings to the background or base. If more than 15 alphabets, an additional cost will be at S$20 instead. Wordings will be added in sticker format. * For cooperates inquiries in bulk orders or express order. Pls, contact us directly to discuss. * Pls take note. For express order process, there will be no sculpted head proofing process due to the limited time constraint.